Summary: When we first put this page up, bike helmet buckles were mostly the Fastex-style pinch release type. There are now unique buckles on Uvex and Abus helmets that use a sliding tab and a single button to release. 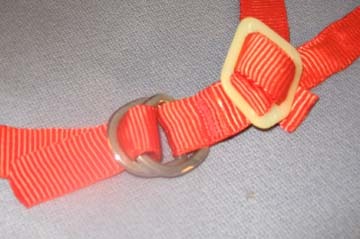 There is also a magnetic buckle branded as the Fidlock, and some others. We don't have photos of those yet. Almost all bicycle helmets in today's market have a plastic buckle made popular by Fastex that has a two-prong male piece sliding into the female side. It releases by pinching the sides of the buckle, where there are cutouts that let you contact the two prongs and press them inward. The Fastex/Nexus buckle is cheap, light, easy to fasten and normally reliable. It has some drawbacks, however. It requires the strap to be adjusted correctly at all times, and retain the adjustment, since it always fastens at the same spot. That means no on-the-fly adjustment is possible, particularly to take out slack that occurs in the strap when you sweat on it. The Fastex is also prone to "strap creep" where the strap loosens gradually over a period of time as it is tugged into position or otherwise jiggled. You may have to tack sew your straps in adjustment to prevent that. We don't like messing with any part of a helmet, but the adjustment issues are very difficult to handle without sewing. The Fastex can break. Typically one prong breaks off. The rider can be semi-aware that something is wrong, but keep using the buckle, since the other prong will hold it together for normal wear. In a crash, however, that buckle can come undone in an instant, letting the helmet fly off. The second impact on the pavement could be with a bare head. Only one manufacturer in the US market, and two in the Euro market, have a different and unique buckle: Uvex and Abus. Uvex has a buckle with a toothed male tab that slides into the female section. It releases with one button. Here is a photo, and another one. The biggest advantage of this buckle is that it solves the strap creep problem by requiring adjustment when you put the helmet on. It also deals with the loosening of straps when sweat-saturated problem by permitting further adjustment during a ride if the strap loosens with sweat. 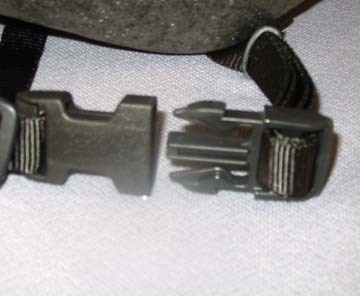 As noted this buckle is found only on Uvex helmets in the US market, but also found on Abus helmets in Europe. There are other buckle designs, but not many in use today. D-ring buckles are too hard to fasten for many riders, although they are cheap, ultra-reliable and facilitate adjustment every time you put the helmet on. 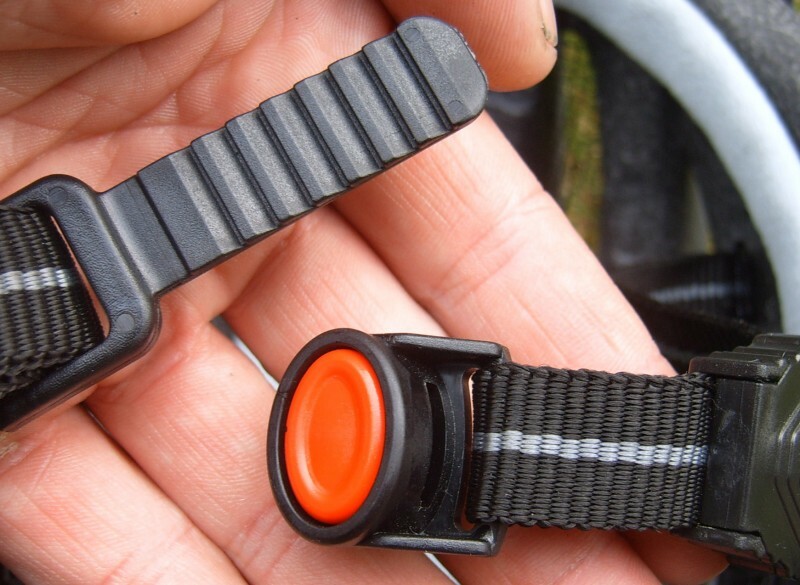 A slider buckle similar to D-rings in operation has the same advantages and disadvantages. 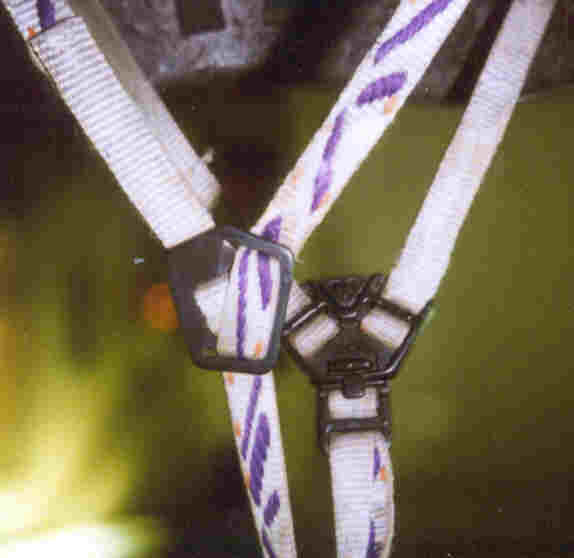 In the 1990's Bell had a hook and snap buckle that worked well and could be handled with one hand. This photo shows it from the inside, with the hook in place. Here is our page on threading the straps through a standard Fastex/Nexus buckle.